The Asus RT-N12 is a 300Mbps Wireless N Router with both wired and wireless network connections designed specifically for small business and home office networking use. With 2T2R MIMO Technology and two detachable 5dBi high gain antennas, the RT-N12 creates a an extended coverage area with advanced wireless performance, making it ideal for streaming HD video, placing VoIP calls and online gaming. It got software EZ switch that provides a quick and easy way to change between router, repeater and AP modes. Instantly select router, range extender, and access point modes with extra-quick settings in the user-friendly interface. No delays and no hassles – whatever your situation, take your pick and get connected. This wireless router also comes with extremely long operating range with high power technology that drastically increases wireless signal coverage and quality with a built-in singal amplifier. Advanced High Power technology from ASUS enhances signal strength and can almost double the range. 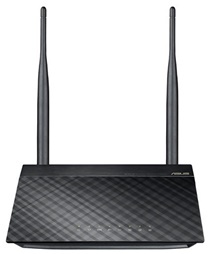 The multiple SSID support on this Asus RT-N12 wireless router also provides up to four wireless networking grades with dynamic bandwidth management. For example, high bandwidth and full access for managers, mid-range settings and privacy controls for staff, and basic internet access for guests. This flexibilty makes it the best choice for SOHO wireless networking. With the Asus RT-N12, setup is a breeze. Simply power and connect the router and open a browser on a Wi-Fi-enabled device like a notebook or pad. You will then be taken to a setup page with a prompt to enter the ID/password from your internet provider, and that’s it! Setting up your network is easier than ever. If you are interested, find out more about this wireless router here! This is the most awful router I could've purchased. I have it mounted up on the wall near the ceiling for maximum coverage and the speeds to other devices is STILL awful.. Not to mention the fact that this router has to be power cycled at least twice per day even after the latest firmware update. I am very disappointed with it and will be going with a different brand in the future. This is a RT-N12 D1. It has all three functions of router, repeater, and wireless access point. It can also be used as a wireless bridge. I am using it solely as a wireless access point to replace the wireless duties of my 54G 2Wire router from ATT Uverse. So far, it does a nice job of giving me wireless. It is single band in 2.4 GHz and does the N 300 spec. It has three available guest networks as well. I really like the stock ASUS interface in that it is very speedy and intuitive. I updated to the latest Asus firmware and it works as expected. The range is better than the 2wire, but only just a little. It makes up for it in the speed of N.
Not much to hooking this up and connecting to the WiFi. Got way more speed out of the router than my service provider gives me. $39.99 for a wireless-n router is a great deal... until you actually have to use the thing more than a couple small rooms away. Range is low compared to my older router. Plus network ports are only 10/100, no gigabit. The blue LED lights aren't too bright and the translucent case (can make out the router internals) looks great. The router has everything I need and nothing I don't. Great value for the price. It runs cool and provides a rock solid DSL PPPOE connection with Tomato by Shibby firmware (the DSL modem it's connected to is in bridge mode). Hasn't dropped below about 65% free memory (32 mb total) with multiple computers and Netflix sessions running simultaneously. The two antennas are removable. Return to top of "ASUS RT-N12 3-In-1 Wireless Router"! !